Development continues moving forward on github, thanks to many people contributing with: bug reports, ideas, code, and translations. Thanks to all of you. Special thanks to Youness Alaoui (@kakaroto) who added the new fullscreen features and has been really helpful lately. This release adds fully configurable fullscreen editing features, and includes many bug fixes and language translation updates. Extra import and export formats such as ePub, OpenDocument (LibreOffice), and DocX (MS Word) are available in manuskript if you also install pandoc. Great! Nice with the extras in Full screen. Thanks for all the hard work! I have been using Manuskript for about half a year now – Simple mode – until now to gather smaller texts that I want to keep working with. I edit and order them and write some notes about them – works as it should, I enjoy writing in the program; the text area is clear and without distraction. 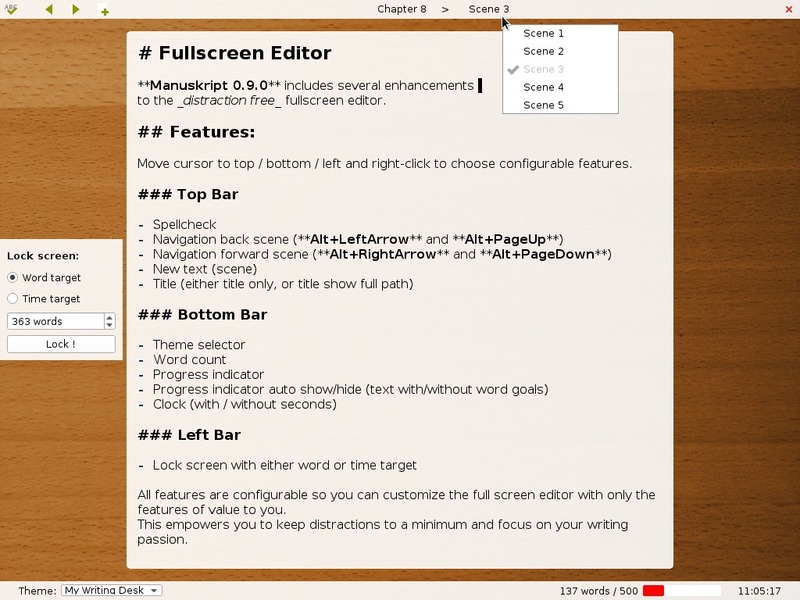 Glad that Linux is getting a replacement for the no-longer supported Scrivener. And happy to see the development continuing at such a pace. Thanks for the new version of the software, whose development obviously requires a lot of passion and time. I use it with satisfaction on Linux to write my stories and tales, and I find it functional and enjoyable. When there are updates, I warmly welcome them. I have the Italian translation ready (.qm and .ts files), I tested it and it’s ok. Do I have to fill out the form on github or can I send you the files ready? Thank you for offering an updated translation. For more information on translations, see our Wiki – Translate Manuskript. Many updates to translations are now handled on Weblate.